‘Tis the season to be jolly, right? We like to think that’s true. We’re social creatures who desire to spend these cold and dark winter months in the company of friends and family. 9 out of every 10 people living in the United States celebrate Christmas as part of that tradition – be it as a religious or cultural occasion (Pew Research Center, 2017). But, the sticker price of Christmas has made the holiday season a little less jolly and a lot more stressful for ALICE families and individuals. United Ways developed the acronym “ALICE” to refer to people who are Asset-Limited, Income-Constrained, and Employed. Overlooked by federal poverty measures, ALICE individuals and families work hard, but still don’t make enough to afford basic expenses, such as housing, child care, food, transportation, and health care. Most recent data from 2016 shows a family of four with two adults, one infant, and one preschooler living in Whatcom County requires a monthly income of $5,540 just to make ends meet. This doesn’t allow the ability to save for things like emergency medical care, home or automotive repairs, tuition, retirement, hobbies, or vacations. To afford things like that, the same family would have to increase their monthly income to $9,311. And there’s a good chance these figures have climbed even higher in the past two years. 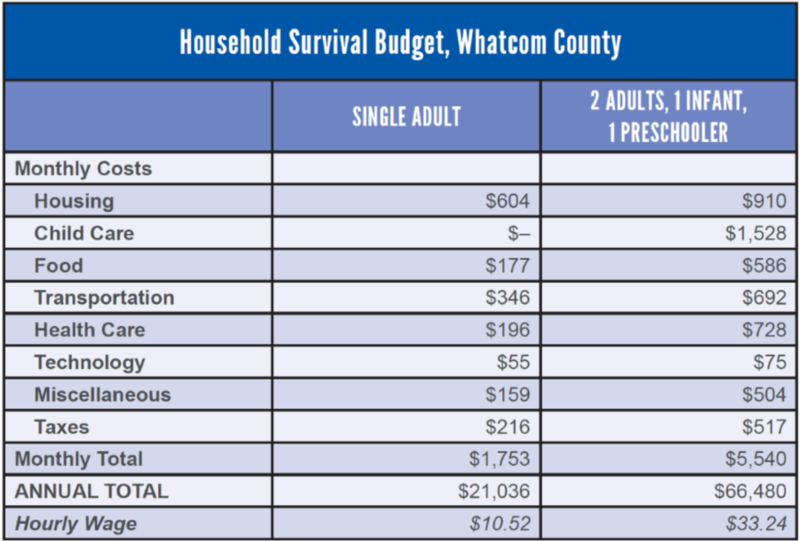 This chart illustrates the most basic cost of living in Whatcom County in 2016 (2018 ALICE Report, United Ways of the Pacific Northwest). If you are ALICE, and 22% of households in Whatcom County are (with an additional 17% in poverty for a total of 38% of local households struggling to make ends meet), the added expenses the holidays bring are not lost on you. A recent Gallup poll reports that adults in the U.S. plan to spend an average of $885 on gifts alone this holiday season. That doesn’t even include the cost of a tree and Christmas dinner, or dishes to pass at those caroling, gingerbread house, and ugly sweater parties you’ll get invited to. And, if your family lives a plane ride away, consider the average cost of airfare for a domestic round-trip flight in 2017 was $363 per person, according to Airlines for America. Bottom line – a family of four could easily be looking at budgeting an additional $2,500 just to be jolly this December. 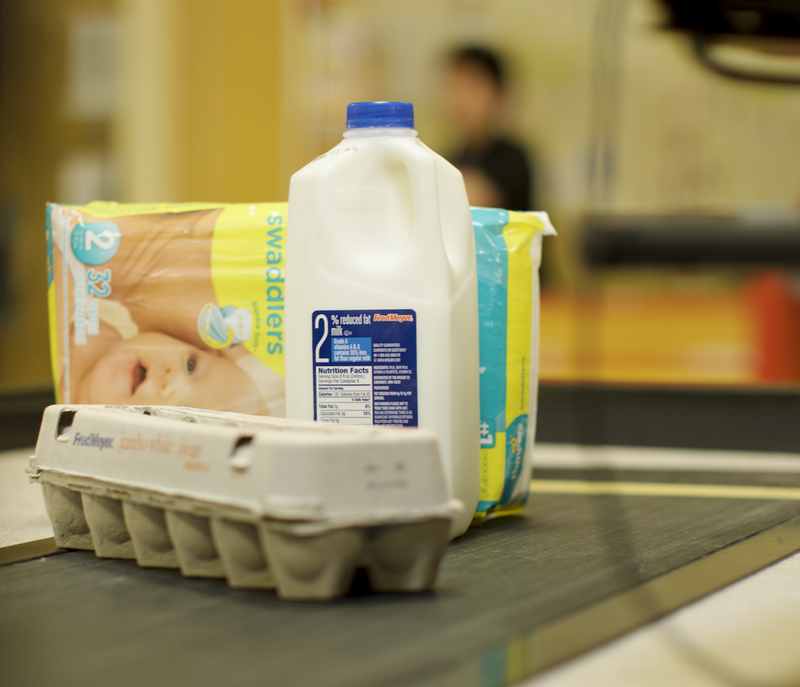 38% of households in Whatcom County struggle to afford basic necessities. For these individuals and families, holiday expenses are out of reach. To some, spending at these average levels might seem like an unnecessary keeping-up-with-the-Joneses sort of show. The solutions seem so easy. Buy the kiddo off-brand sneakers. Pass on the invitations to the pot-lucks. Send dear old ma and pa a nice card and skip the airfare this year. But… It’s. Not. That. Simple. No parent wants their child to be the kid who gets made fun of on the playground for having the off-brand Skip-It (okay, maybe a dated example from my own childhood, but you get the point). This is partly true because parents care about social status themselves, but mostly true because parents want their children to feel, as Kristen Miale put it, like they “belong in a world where every message they receive tells them that they don’t.” Miale explains how these luxury items have become “social must-haves” in her TEDx Talk. It’s true that cutting out the plane ride to see family out-of-state would account for about half of a family’s holiday budget – maybe more when you add in any unpaid time off work, but isn’t the whole point of the holidays to spend time with people we love, wherever those people are? In reality, ALICE families aren’t able to fly across the country to see their loved ones at any time of year, but shouldn’t they be? Isn’t it sad that we are at a point where seeing family has morphed from being a right to being a privilege? Then, there are the pot-lucks. They might seem small and easy to cut, but think about what they represent. Like seeing family, these gatherings represent our connection to our communities. They are our chance to celebrate the holidays with friends – the family we choose, so to speak. Attending reminds us we are part of a community. It helps us feel whole. So, why not just attend without bringing a dish to pass or a thank-you gift for the hosts? These parties also take us right back to the first time we unknowingly wore a knock-off pair of sneakers to school or brought that wannabee-Skip-It to recess. We’ve been conditioned to hide any evidence that we may lack material wealth. This leaves ALICE individuals having to choose between the cost of shame and social isolation or the cost of financial debt if they take on holiday expenses that they really can’t afford – or the cost to their own health if they forgo their own needs, such as skipping meals, in order to make sure those name brand sneakers make it under the tree. So. How do we bring back the jolly? We start by changing our mindsets. We work together to raise the next generation to judge less. To give when they can. To acknowledge what power and privilege they may have and use it to do good in the world. To blame poverty on the system and not the people in it. To change the system. To take the shame away. To LIVE UNITED. United we fight for the financial stability of every person in Whatcom County. United we fight for the jolly. Our future depends on the jolly. We hope you’ll join us.